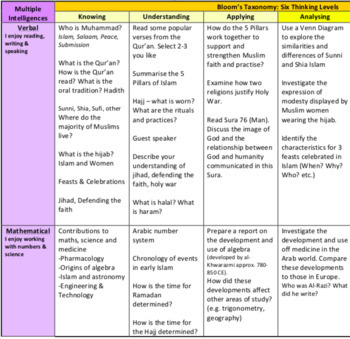 This Matrix of learning activities allows teachers to explore the the Islamic religion respectfully and with an open mind. It is differentiated to meet the learning needs and interests of students. It examines the history of Islam as well as the past and current contributions of this religion to society. 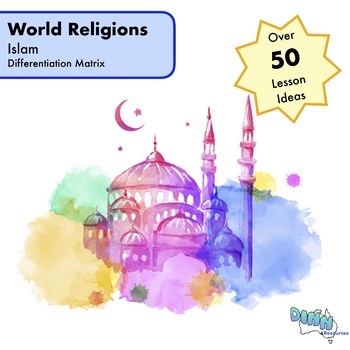 This unit separates culture and fundamentalism from the religious practices of Islam as they often taint how Islam is perceived and understood. This unit aims to promote knowledge, respect and understanding. This resource suits those who may be new to teaching or who may be looking to change or add learning in their school. This resource is very detailed and allows users to modify learning to meet student needs.